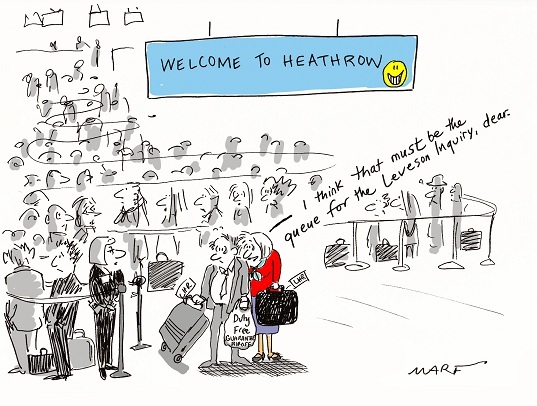 So far in the London mayoral race all the polling has come from online firms. Tonight sees the first telephone poll by Populus for the Times. The first preference lead of 12% is in the same region as the 11.2% that Survation had in the Telegraph on Friday. The big mystery is which pollster is getting this right. YouGov this morning had just a 3% lead for Boris. There’s a furious fight going on for third place with Paddick and Benita on 5% one behind Jones on 6. We should know on Friday which is right. Cameron going the extra mile for Jeremy Hunt, loading ever more on #Leveson buys time, but may not pay off in the long run. 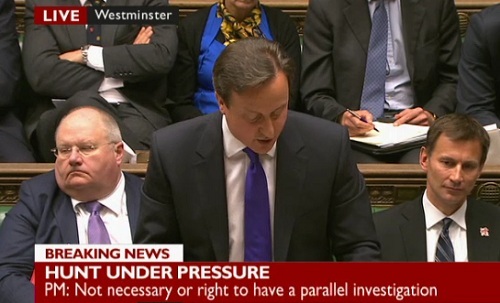 Cam line of giving everyone a chance, “It’s called natural justice”, was exactly same line he used during Fox hunt. Tory party extremely lucky there aren’t many voters watching this. Could he just squeeze in? The latest YouGov London poll for the Evening Standard is just out and has Boris only 3% ahead on first preferences. That margin is what the US media would call a “statistical dead heat”. Clearly, if YouGov have got this right, this battle is far closer than the other pollsters who’ve been covering it are making out. Before the weekend ComRes had a Boris 1st preference lead of 9% with Survation recording 11.2%. Hopefully they’ll both be doing final polls so we can compare. I’m putting the emphasis in my reporting on the first preference shares which in polling terms are more robust than the 2nd preference allocations. YouGov, on their calculation, reckon that the lead after 2nd prefs is 4%. The Standard report of the poll states that of the Lib Dem supporters giving either Boris or Ken their second preference, the former got 70%. Could the reds win more than the initial 700 seat projection? There’s a new Survation poll out in the Daily Mirror which has both Westminster and local election voting intention for this Thursday. The national numbers are CON 30% nc/LAB 37%+2/LD 13%+2/UKIP 9%-1 with comparisons on the firm’s poll a fortnight ago for the Mail on Sunday. The local shares represent a 12.5% swing from CON>LAB; a 4% swing from CON>LD; and a LD>LAB swing of 8.5%. A limitation of such polling is that in many places there are no elections taking place and even where there are not all parties have fielded candidates. So people might have responded with a party choice that they are not able to exercise. Thus in England the Tories are contesting 97.1% of wards, LAB 95.5% and the LDs 70.5%. In Wales the Tories are down to 46.7% the LDs 28.0% with LAB fighting 72.5%. Whatever the big picture is that reflected by the Rallings & Thrasher projection that I reported on a fortnight ago. LAB doing enormously well if only because the 2008 elections, with which these need to be compared, were a nightmare. The red team should be expecting 700 plus seat gains at the very minimum. The R&T projection, based on trends in the weekly local by-elections, was that on Thursday the split would be CON 34%/LAB 37%/LD 18%. NOTE – much of the data featured here came from the Rallings & Thrasher briefing organised by the Political Studies Association two weeks ago. 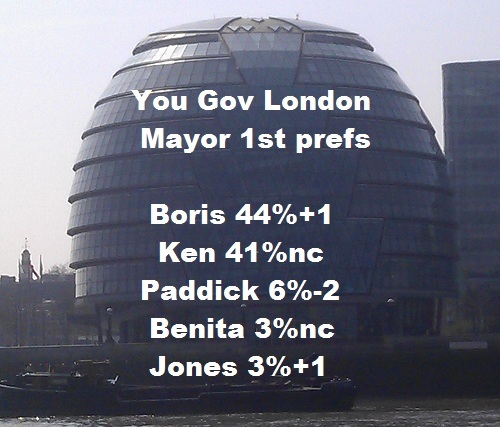 With the last two Mayoral polls showing first preference leads of 9% and 11.2% for Boris it’s hardly surprising that on this final weekend the money has been going on the incumbent. I’m being a tad more cautious. YouGov’s final polls in both 2004 and 2008 got it correct to within 1% and there should be a new survey out tomorrow. Remember that four years ago the other pollsters had it as a dead heat or Ken ahead. Although I’m often critical of YouGov you cannot fault its record with this election and its last poll had the gap at just 2%. Is this not just a setback but a long-term nightmare? 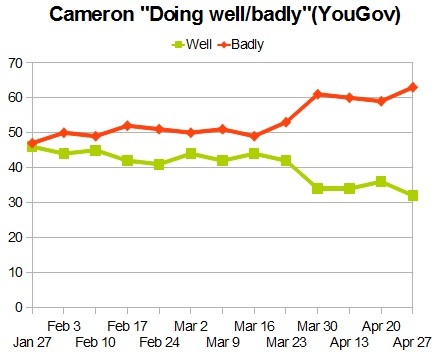 The weekly YouGov leadership ratings for David Cameron are out and add further to trend we’ve seen since the budget. He’s gone from a neutral 46% Well 47% Badly at the end of January to 32% Well 63% Badly this morning. As PB regulars will know that at this stage before an election I place much more importance on the leadership numbers than voting intention. In this poll the party shares were CON 29%/LAB 40%/LD 11%/UKIP 10% – the Tory 29% rating equaling their lowest ever in a YouGov survey. If these and other polling numbers are reflected in the local elections on Thursday then then blues are going to see huge losses which will only add to the negative narrative. The big question now is whether the situation is recoverable? It is always said that Dave is at his best when his back is to the wall. The next week or so could test that theory to the full. Meanwhile the position of Jeremy Hunt looks even more precarious and Ladbrokes have now tightened his “next Cabinet exit” price to 4/6. Last Sunday you could have got 50/1. In the next Tory leader betting the money has started to go on House Minister, Grant Shapps. I put a bet on last night at 25/1 – that’s now shifted with Ladbrokes to 16/1. 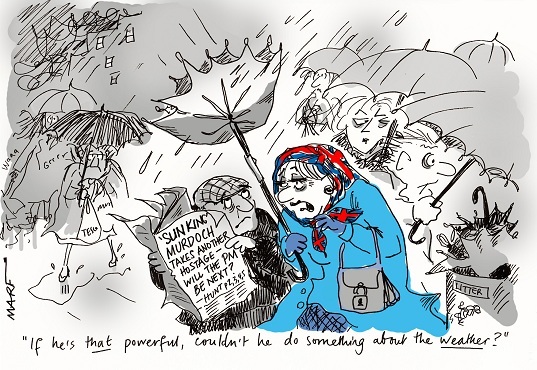 What are the Sunday going to report? This is the Observer front page. The Mail on Sunday steers clear of Hunt on its front page.